On a wide-screen TV set can be seen the words: News Hour. A man on the TV screen announces: Google will encrypt internal cables to keep the NSA out. The backs of the heads of a man and a woman are seen, who are apparently watching the TV program. Woman: We should do the same. The second panel shows the man and the woman sitting on a sofa, viewed from the front. 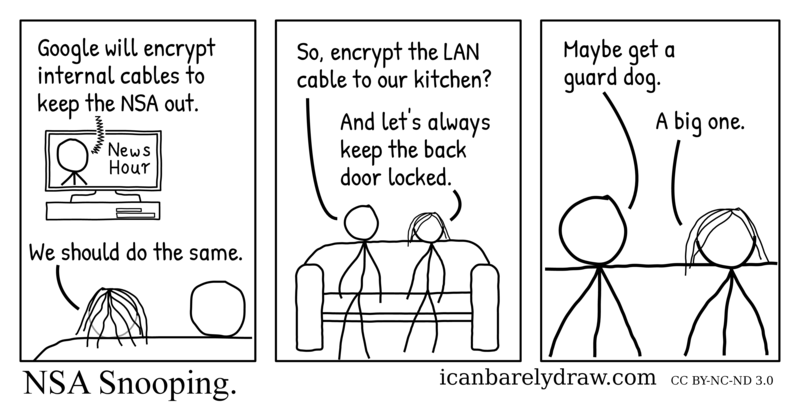 Man: So, encrypt the LAN cable to our kitchen? Woman: And let's always keep the back door locked. The third and final panel shows the man and the woman in a closer view. Man: Maybe get a guard dog.